WaPo Laments False Rumor Obama's a Muslim: He's Been a 'Diligent and Personally Committed' Christian? Thursday's Washington Post reports that a new poll by the Pew Research Center found “The number of Americans who believe – wrongly – that President Obama is a Muslim has increased significantly since his inauguration and now account for nearly 20 percent of the nation's population.” Team Obama quickly blamed “'misinformation campaigns' by the president's opponents.” The Post's Jon Cohen and Michael D. Shear just pass that along without any specifics. But what's really shaky is the story's accuser, Obama “faith adviser” Joshua DuBois, trying to tout how the president is deeply, “diligently” Christian, when the president is much more diligent at golfing than he is at church attendance. The number of Sunday church services Obama has attended since the Inauguration doesn't get beyond counting on one hand, even bypassing the pews at Christmas. In other words, DuBois is claiming that Obama's given more speeches on faith than he's attended a church service to hear a minister's speech on faith. Blaming the media for "scant coverage" of Obama's allegedly devout Christianity is the lamest line DuBois offered. 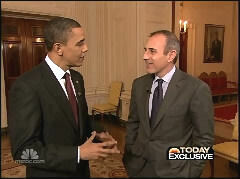 Matt Lauer and other journalists (like Obama's Five Guys burger partner Brian Williams) would have been more than willing to offer supportive time for Obama to discuss his religion. These Post reporters should have pressed DuBois about Obama's obvious and public lack of interest in the subject -- suggesting that perhaps the idea that Obama's fervently, diligently Christian is more rumor than fact -- and whether that noticeable apathy is a bone to his secular-progressive political base.